LiveU’s annual ‘State of Live’ report. 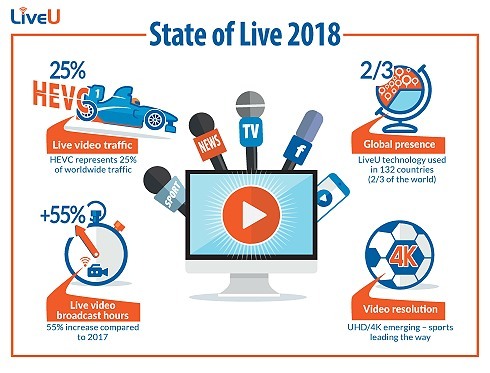 Hackensack, NJ, December 2018: LiveU’s annual ‘State of Live’ report has confirmed the growing adoption of the HEVC protocol as the industry standard with 25% of LiveU-generated traffic now HEVC-encoded. These figures reflect the increasing demand for professional-grade video quality, a trend most evident at this summer’s FIFA World Cup™ in Russia.